Backstage with Pearl Jam and Jon Tester. MONTANA’S junior senator, Jon Tester, a 56-year-old farmer from Big Sandy, is facing a crowd of a few hundred supporters gathered near a sculpture of a grizzly bear on the state university’s Missoula campus. Now and then a breeze blows through the rally but fails to ripple Tester’s hair, a flat-top once favored by Greatest Generation shop instructors. Like few other politicians of his rank, Tester, a populist-minded moderate Democrat whose narrow victory in 2006 was crucial to helping his party win the Senate, more closely resembles the folks he represents than they resemble themselves. He listens to the Elvis channel on Sirius XM Radio. He used to play taps on his trumpet for veterans’ funerals. Will his anti-charisma come through for him again? His challenger, Denny Rehberg, the state’s long-serving only representative, knows from the deadlocked polls that it may not. That’s where Pearl Jam comes in. Pearl Jam’s bassist and co-founder, Jeff Ament, just happens to hail from Big Sandy, too. Ament was a hot-shot basketball player back when Tester was refereeing junior high school games in the 1970s. As Ament remembers it, they formed their bond after he bad-mouthed Tester for making a call against him, an act which should have earned him a technical or an ejection. But the ref surprised him: no infraction for his smart remark. This little friendly oversight would lead decades later, in 2005, to a big-money, big-publicity benefit concert by the one-time gods of grunge. This Pearl Jam show, say Tester and his backers, was part of what brought him his U.S. Senate seat. It also refuted the academic lie that politics is in any way a science. Politics is a kid who plays the bass whose father, the town barber, gives a retro haircut to a neighbor that follows him into his career in politics as a symbol of his unspoiled down-home integrity, convincing the kid, who has since become a rock star, to throw himself and his band behind his run. From my place on in the stands, I listen to Vedder’s short speeches between songs. He ridicules Mitt Romney’s life of privilege and laments that he “has never had the thrill or terror of walking on the tightrope without a net.” He points to the stands and calls out to Senator Tester, who’s standing cheerfully inert and hefty like some kind of kitchen appliance, charmingly uncertain of how to act. 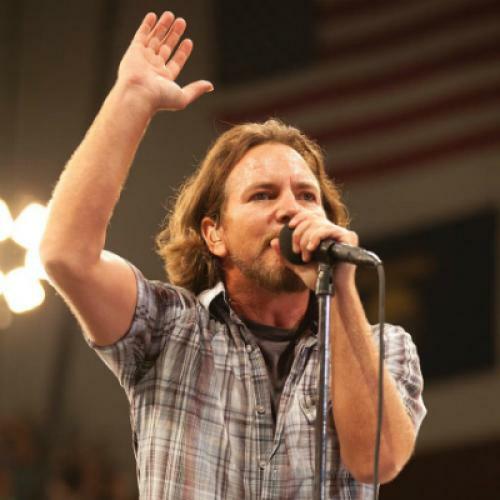 (“Music,” Tester said to me before the show, “is what separates us from the animals.”) Vedder makes the small mistake of praising the senator for rousing himself every two years to run for office. This hipster version of an Eastwood moment eventually yields to the power of raw decibels in the form of a cover of “Know Your Rights,” the Clash song. Pearl Jam, though, is not the Clash, whom it’s hard to imagine serving a mere candidate—and equally hard to imagine being asked to do so. Nor is Pearl Jam Creedence Clearwater Revival, whose “Fortunate Son” they vividly reanimated with the curatorial proficiency of a Rock and Roll Hall of Fame performance. Instead of reverence for its majestic rage, I would have liked some mournful appreciation of what makes such rage impossible these days: namely, the obligation to pay it homage as part of a protest-music folklore project. Rocking the vote has turned into a nostalgia trip, safely evoking a subversive past while catering to the mass-market political present. In this, they walk a tightrope of their own.